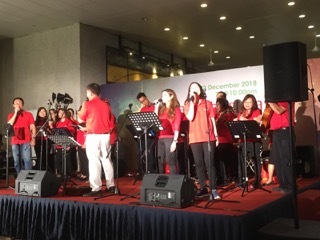 This Christmas, together with some members of Wesley Methodist Church, members of Cairnhill went to 7 different places to carol and spread Christmas cheer to the public with their ukuleles. It all started with Lucy, our missions staff, who took the initiative to learn some creative ways in reaching out. Her search brought her to Wesley Methodist Church, which was conducting ukulele lessons. Soon, other members of the Cairnhill family joined her to learn the musical instrument. Every place the team went to had its unique blessing, but the highlight was at the Sungei Tengah Lodge where 23,000 migrants are housed. Praise the Lord, seeds were sown, and the harvest will be plentiful. The Cairnhill Ukulele team is still young and in the midst of refining their skills. We are praying for more passionate people to join and add to the strength of the group. Meanwhile, enjoy the photos and be encouraged!